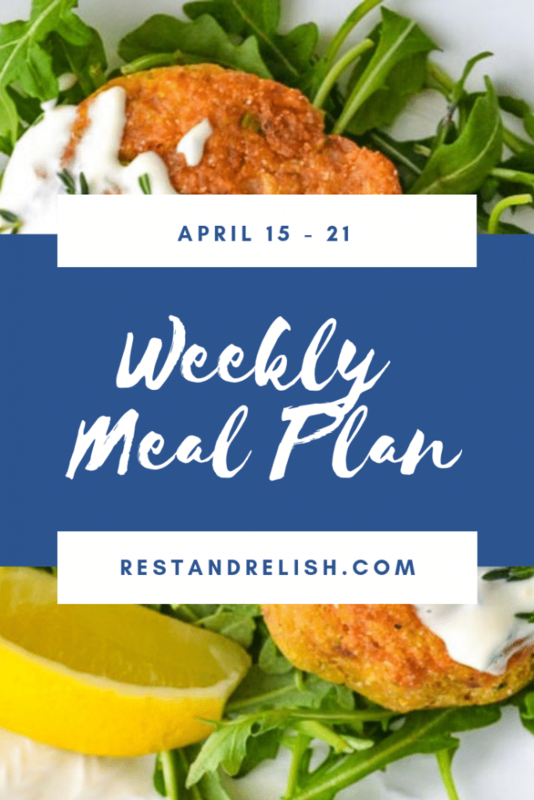 The Rest & Relish Weekly Meal Plan includes six easy vegetarian or pescatarian dinners with simple substitutions for vegan and gluten-free diets. These easy salmon cakes are one of my weeknight favorites! It’s a protein-packed meal ready in under 30 minutes. Salmon cakes are delicious on a bed of arugula with steamed or roasted vegetables on the side. We toss asparagus with a little olive oil, salt and pepper to roast for approximately 20 minutes at 425 degrees. Family Friendly Substitutions: We have one child who doesn’t enjoy seafood, so I buy fully cooked chicken skewers from Costco for many of our seafood nights. Neither of my children like asparagus, so I’ll steam some frozen broccoli for them. Beans and rice; easy, cheap, and healthy. Add onions, peppers, spices and you have a flavorful meal ready in no time. I love using my Instant Pot to cook rice. We usually choose brown rice, but feel free to substitute white or yellow rice depending on your family’s preference. Add healthy toppings such as shredded carrot, chopped tomatoes, cilantro, and your favorite salsa. Bonus Meal Prep Tip: This is a great meal that can sit for nights where family members have different commitments. The beans and rice can be kept warm or reheated and the toppings are easily stored in the refrigerator. Thai cuisine is a favorite in our household and is so accommodating for our various dietary restrictions. I make homemade Pad Thai using brown rice noodles, so this is a great gluten-free meal! I love to buy pre-marinated and baked tofu for this dish, which will significantly reduce your meal prep time. You can leave the tofu out for those who are not fans or substitute chicken for extra protein. As far as recipes go, I wing it with Pad Thai but there is usually a standard recipe on the side of the noodle box. Would you be interested in a full recipe of my version? Another busy weeknight, so this veggie-packed salad is a go-to for our family. I plan to serve this salad over additional raw spinach for added veggies, as well as add leftover chicken for the kids. Choose your favorite mild white fish to bread with gluten-free breadcrumbs and seasonings. If your’e looking for an exact recipe, Gwyneth Paltrow’s Gluten-Free Fish Finger recipes are very good. You can find them in her It’s All Good cookbook. Feel free to substitute chicken for fish if you’re not a seafood-lover. Alleuia! Our family will celebrate Easter today with a variety of traditional Easter dishes. I’ll likely make a quiche and salad, as well as my perfect deviled egg recipe and carrot pecan bundt cake. I hope the Rest & Relish Weekly Meal Plan is helpful to you. What looks good to you this week?